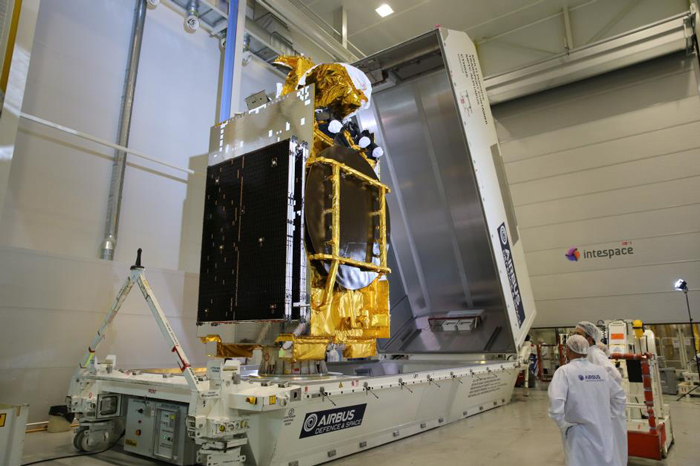 Badr 7, also known as Arabsat 6B, is a commercial communications satellite built by Airbus Defence and Space and Thales Alenia Space, to be operated by Arabsat to deliver Direct-to-Home Television. Badr 7 was built by Airbus Defence and Space based on the flight-proven Eurostar-3000 satellite bus. The platform is capable of hosting communications payloads with a total power exceeding 16,000 Watts. The spacecraft platform can support a high degree of customization to be able to support a variety of payloads including commercial communications and military payload packages. Eurostar-3000 made its first launch in 2004. The Badr 7 satellite has a launch mass of around 6,100 Kilograms. The spacecraft stands 7.5 meters tall and, in orbit, its deployed solar arrays have a span of over 30 meters. Two deployable solar arrays are used for power generation featuring triple-junction Gallium-Arsenide solar cells. Power is stored in onboard batteries while a Power Conditioning and Distribution Unit regulates the satellite’s power bus and controls the state of charge of the batteries. Badr 7 will generate a total power of 11,500 Watts at the end of its mission. 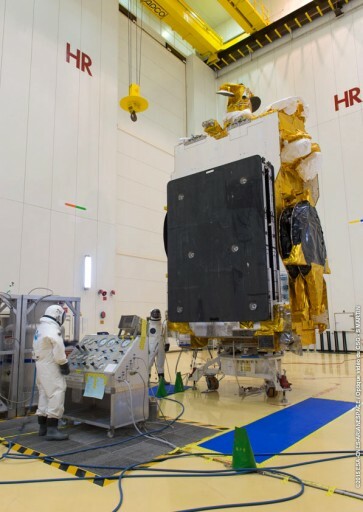 The communications payload of the Badr 7 satellite was built by Thales Alenia Space and is comprised of 27 active Ku-Band transponders plus 24 Ka-Band spotbeams and an additional three Ka-Band transponders for an extension of services when needed. The communications payload covers North and Central Africa and the Middle East. Badr 7 will be co-located with the rest of the Arabsat Badr constellation to become part of an orbital video hot spot, extending the current capacity for Direct-to-Home television services. Stationed at 26° East in Geostationary Orbit, the Badr 7 satellite will operate for at least 15 years. Copyright © 2019 Ariane 5 VA227 | Spaceflight101. All rights reserved.